Boise Guardian | Conflict or Coincidence? A little work on the internet by GUARDIAN sleuths turned up some interesting data on a Meridian arms dealer who happens to also be a state legislator pushing a bill to allow people to carry weapons concealed in vehicles without a permit. Seems that Sen. GERRY SWEET (R) Meridian is president of an Idaho corporation known as SHOOTERS WHOLESALE, Inc. The company is listed on web sites all over the country as holding a Federal Firearms License (FFL). That means he can facilitate interstate arms sales over the internet. The GUARDIAN is not a player in legislative affairs, but we think it may not serve to enhance the image of the legislature or garner public confidence to have a gun dealer advocating a law that potentially would put more concealed guns in Idaho vehicles. Idaho cops and sheriffs oppose Sweet’s bill on the basis of officer safety and the fact they can use the current law as a tool to disarm potential criminals before they commit illegal acts. We hear the bill was quietly withdrawn Monday, but officials of the National Rifle Association (NRA) will probably be in town Wednesday to meet with lawmakers, cops, and arms dealer/legislator Sweet. Perhaps someone can also check out to see if Sweet and/or his family ever paid back the $$$ to creditors when the “Intermountain Arms” folded. Yet another example of how bloggers are taking the role formerly held by investigative journalists. This sounds very similar to the violation committed by Jack Noble before he was forced to resign and helped spawn the ethics legislation currently winding its way through the Statehouse. I am particularly gratified when a bible thumper who cloaks himself in self righteousness gets his hypocrisy exposed. Great post Dave. Wow, witch hunt here. As a general rule, a law-abiding citizen will NOT draw a gun on a cop, because he has one in his car. Just like a criminal isn’t going to carry a gun in his car, because it is against the law. Gerry’s law only helps keep the law abiding citizens law abiding. Heck, if you carry your pistol with you, going out to the range, unless you are VERY specific in how you carry it in your car, you are breaking the concealed weapons laws for Idaho. In a truck, it is all but impossible to legally cary a pistol. I got a concealed-carry permit a few years back… not because I felt a compelling need to pack heat, or because I intended to carry a gun, but so I wouldn’t be in violation of the law if I wanted to occasionally carry my gun under the car seat, or in a motorcycle tank bag, etc. I would suspect that most rank-and-file cops see no threat from armed LAW-ABIDING citizens. And the law-breakers, by definition, aren’t very concerned about obeying the law anyway. Guardian… if you want to discuss “conflicts” in the Legislature, why not shine the light on situations that probably affect all of us WAY more than this gun law? How about pointing out all the “developers” in the Legislature, who vote pro-development? Or the insurance brokers, who pass laws requiring us to have insurance? Or the attorneys? Or the bankers? Or the farmers? IMO, it’s totally unfair to single out Mr. Sweet, and suggest that there’s something wrong because he doesn’t check his beliefs, opinions, and “agenda” at the door. In fact, name a legislator who doesn’t have a personal dog in the fight. The reason most of ’em are involved is because they feel they can be a champion on behalf of their constituencies, or their circle of cronies, or themselves. Why is it a witch hunt? Replace the words, arms, weapons, guns with liquor, real estate, and Garvee you still have a stinking mess. Kudos to you Dave for bringing this forward. When, oh when, will we have real ethics reform at our Capitol??? Publicize Sweet’s bill and we’re on the road to victory! I don’t think the focus of Dave’s post was on Gerry’s law but its sponsor who has an apparent conflict of interest. Passage of the law will likely line Gerry’s pocket. If Gerry failed to disclose that he would materially benefit from the passage of a law he sponsored, he is deceiving his constituents, his colleagues and undermining the efforts of those who seek its passage. I wouldn’t call this post a witch hunt since its not attacking the law itself. I call it focusing on ethics in government. But since Kevin brought it up why is every major law enforcement agency in the state opposing Gerry’s law? I think the major law enforcement agencies have had the wool pulled over their eyes, as to what the bill is about. Some how, our society accepts guns = bad, when they are not. They are just a tool… like the cars that drive on our streets (which cause far more problems, than guns ever have, but they haven’t gotten the evil lable applied to them). And, how exactly does carrying a pistol under the backseat of a car, or some other unassuming place to keep it from tempting a wood-be thief, line Mr Sweet’s pocket? I REALLY fail to see the connection. Since he does sell rifles, and pistols, I can definately see him championing a law that allows the people of Idaho legally carry their pistol with them, in their car, whenever (and however) they want to. I honestly do not see the connection you are trying to make, saying he will gain a profit. YOU, not the GUARDIAN also talk about guns being bad and Sweet gaining a profit. Nice to know it’s an arms merchant behind a gun bill and not a peacenik school teacher! Gerry Sweet was a part owner of Intermountain Outdoor Sports when he first ran for office. God & everyone knows he has a federal firearms license, so that’s not news. Actually, his pro-gun, anti-government (ie gun laws), conservative beliefs are what got him elected. This article is Much ado about nada (that was for you culturally diverse poets). Thanks for responding Kevin. I fail to follow your analogy to cars however. Both have lethal potential, but guns are much smaller and really only has its lethality as its singular purpose. Cars have tremendous utility. Moreover their use is heavily regulated. This bill seeks to remove most of the restrictions on weapons being concealed. How will de-regulating concealed weapons laws make the use or ownership of the weapon safer for the rest of us? Certainly law enforcement doesn’t agree. Don’t you think that anytime your representative has the potential to profit from his proposed legislation he should inform everyone? Guns have utility as well. Entertainment. I really enjoy shooting paper targets. I don’t go hunting (haven’t been hunting in very close to 20 years), I just like to shoot, and even have dabbled in organized shooting. To me, that is great utility. Lethality is not its singular purpose. Precision is the purpose of all of my guns. You keep trying to push it back on me, asking how it will make us safer. I don’t think it will, on the flip side, I don’t believe it will make us any less safe, and I believe the law enforcement agencies (that I have not seen any specifics I might add) are using a knee-jerk action. A person that is going to break the law, will break the law. It doesn’t matter if you can “conceal” your gun in your car, or not. A law abiding citizen, on the other hand, could EASILY, inadvertantly break the law, how they are written. I have a CCW license. In all honesty, this bill doesn’t affect me at all, but I believe it is a good law. If you carry a SWORD in your back seat, how the current law is written, you can be held on concealed weapons charges. A bowie knife fits in the same definition. Now, I will admit, I have not read into the law much. I don’t know if the terms in it would apply to a weapon, or a hundgun, or a firearm, but it could also fix that particular issue. I believe in freedoms, and a freedom restored, no matter how small, is a good thing for everyone. Doing the right thing, even for the wrong reasons, is still the right thing. Even if Mr Sweet DOES have the potential to profit, he is still doing the RIGHT thing, restoring freedoms to law-abiding citizens. And, I will once again point out, that carrying guns in your car is legal. Hiding a pistol out of view so a thief can’t steal it, on your own property, in your own vehicle, should not be a crime. Mr Sweet is fixing that. So to carry forward with your car analogy Mr. Sweet’s proposal would be like forgoing the requirement of a drivers license just because law abiding citizens promise to obey the rules of the road. I’m sure you and I both agree that their should be a minimum amount of training to use either a vehicle or a gun. Freedom versus safety continues to be a debate in this country. I guess my attitude on this issue is if their can be time, place and manner restrictions on our freedom of speech then they can have time, place and manner restrictions on our right to bear arms…in the public interest, of course. Kevin I don’t mean to put you on the defensive. I enjoy the dialogue and appreciate your comments. I guess you kind of run into a matter of semantics here. I have a problem considering a gun “concealed” while it is in my car. A police officer can not search your car, without probable cause. It is your property. Just like your home, but a firearm is treated as if it is on your body and concealed. From my standpoint, I just can’t see that being a problem. I guess that is where I ultimately have a problem with this. I feel that the government has too much power over my property in this instance. Heck, before I got my concealed weapons permit, I didn’t realize that putting a gun out of view in my car was a violation. These are firearm violations that a person can inadverantly find themselves in. They are not just little slaps on the wrist. As for training to use a gun, I tend to agree, but I know kids whose fathers taught them more about shooting than hunters ed, or most classes would. But, here is a problem with the training scenario. A person wants to learn how to shoot. They buy a gun, to learn with. They buy the gun and ammo, and put it in their car, to take training. Maybe they put it in a duffle back with some targets, ear protection, eye protection. Then, on the way to training, they get pulled over. The police search their car for some reason, and there is the gun, and ammo in the duffle bag on the floor behind their seat. BUSTED. This is how the law works. You can have hunters ed, or some sort of firearms training, do the same thing mentioned above, going out to target practice, and the same issue. BUSTED. You have the bag within reach, and it is concealed. That scenerio is VERY plausable, and I feel very wrong. The problem with most of the concealed weapons legislation, is that it is aimed at bad guys. Bad guys are BAD GUYS because they already don’t follow the law. I am “taxed” to be able to carry a gun concealed. $25 every 4 or so years (I believe, it isn’t much, but it is still a charge). Every person in the nation has the right to bear arms. That is in the constitution. I think carrying a gun on your person is part of that. It was a relatively normal occurance in colonial times. We are giving up our rights, as law abiding citizens, on useless legislation. That is where I have a problem with your statement. Anyone CAN carry a concealed weapon. By its very nature, you can’t see it, you can hide it. So, cops can’t go around randomly frisking people for guns. Do you honestly believe that people that break the laws using fireamrs are going to break them more, if there were not concealed weapons laws on the books? I understand the emotion involved with wanting to ban concealed weapons, but I don’t understand the logic. Bad guys are still going to do bad things with guns. Good guys are not. The only people that get hurt by the law, are those that don’t know any better. That is the unfortunate truth. Love the banter here. Let freedom ring! My understanding of the “concealed carry” permit, is that if you are granted a CC permit by the sheriff, you can legally carry a concealed firearm which is “loaded”. What good would an un-loaded firearm do if you needed to exercize your right to defend yourself with it. Was Sweet’s bill about transporting “un-loaded” firearms or allowing concealed transport of “loaded” firearms without a CC permit? Does anyone know? I think in Idaho it is illegal to have loaded firearms in a vehicle. Although in Idaho, if you are handicaped, you can legally shoot game from a vehicle, possibly even a moving vehicle. I distrust Sweet and his motives. If ever there was a reason to get a carry permit it is to defend yourself from gun nuts. any lawfully possessed shotgun or rifle. Now, what is the difference between a knife and a dirk or dagger? At what point does that change. Just a little loophole in the law, that bothers me, there. This shall not apply to any pistol or revolver located in plain view whether it is loaded or unloaded. 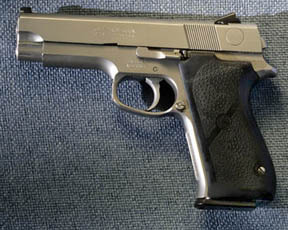 A firearm may be concealed legally in a motor vehicle so long as the weapon is disassembled or unloaded. Though, with one caveat. When I received my CCW license, I went through a formal training process. There are some legal issues surrounding CCW that I wanted to be well versed in. It is not something to take lightly. Anyhow, the problem that I see with this, is that we were told that having ammo within easy reach could constitute breaking the law. I guess I will fall back on my earlier statements, though. 1) More freedoms are better than less. 2) A law abiding citizen, will not shoot a cop, or another individual, just because they have a loaded gun in the car. So, reading the law, it seems that Mr Sweet’s law would pertain to a loaded firearm. As for the comment about gun nuts, you should look at the stats. Those of us that are legal to carry concealed weapons are very UNLIKELY to break the law with them. We have to go through a full background check before we can get the license, so we are held to a higher standard than normal gunowners. I kind of resent that comment about gun nuts. Kevin, I don’t have a problem with holders of CC permits unless one of them tries to shoot me. I personally don’t agree with transporting loaded weapons in vehicles or leaving loaded weapons in a vehicle. There are good “gun nuts” and bad “gun nuts”. The bad gun nuts think the we should live in an armed camp 24/7 and this will somehow make us more free. I personally don’t want to live in a sociey where everyone needs to be armed all the time. Sweet is an opportunist and an attention getter. I wonder if the NRA really supported his bill or is he just saying that? If he really cared about saving lives and preventing crime why didn’t he sponsor a bill to get those invloved in auto accidents due to cell phones slapped with felony crimes. Labeling people like me as a “gun nut” is kind of counter productive to an informed discussion. I am a gun owner. I like to take my guns out to the desert, and shoot targets. I also believe in the right to own and bare arms. I think that we have a LOT of laws on the books that abridge those freedoms, to make people feel warm and fuzzy inside. What they really do, is make it difficult for people like me to enjoy our guns, while the bad guys just go about doing whatever the heck they want. Just because someone else is armed, does not mean you have to be. The whole point of a concealed weapon is that you don’t know that they are around. The people I would worry about, were the ones that flaunt that they have a gun. Carrying a gun is a MAJOR responsibilty. As for the NRA, I know the NRA is supporting a similiar bill down in Utah. The NRA, in general, is for giving gun owners rights. This expands our rights, so I would guess that by default, it would be supported. As for cared about saving lives, what in the HECK does most legislation have to do with saving lives? This legislation was never about saving lives, that I could tell. It was to keep law-abdiing citizens, on the right side of the law. As I posted earlier. Large knives are considered weapons in the Concealed Weapons language. The problem is that the “large knife” category isn’t defined, which means an officer’s opinion, not the law, constitutes an infraction. Personally, I have my CCW for convience. I CAN carry guns on trips, concealed. That is the reason I have it. It also has the added benifit, when I go out shooting with my buddies, we can just put our guns in the cars, and not worry that our home protection gun is unloaded and checked, before being put in the back seat. People keep trying to turn this debate into something it is not. The debate is only about keeping law-abiding citizens on the right side of the law. This isn’t evil, I see NO way in which it can enrich Mr Sweet, it won’t save lives (it won’t end them either). The cops, I believe, are either uninformed, or adding spin. I have only heard about 1 report in the statesman, and can not find ANY news release from local law enforcement on their websites, saying they are against this. So what is your definition of a “gun nut” John? Someone who owns a gun? If so think about this: If you obtained a carry permit, and started to carry to protect yourself from the “gun nuts”, based on these two qualifiers alone, people like you would consider YOU a gun nut….!! As far as this topic goes…the present law is useless and from a strict interpretation standpoint probably unconstitutional. And it doesn’t protect the police or anyone else one bit. Anyone who has a mind to break the law and carry a loaded gun in their car (without a CCW license) is already doing it, present law be damned (these would be the bad guys who don’t obey laws anyway!!). Only the “law abiding citizens”, who were never a threat to begin with are obeying it. Jim ,I would really like to know how many people have been cited in Idaho by cops for having a gun in the jocky box without a CCW permit. The reason I brought up the cell phone/car accident thing is the fact that we KNOW it is a problem and it harms innocent people. Is Sweet’s bill that important to people who might not pass the litmus test to get a CCW? I know lots of people who shoot guns in the desert and I’ve never heard of one being harrased by cops about how they transport their weapons. Like many laws in the Idaho Code, clarification is needed. I’ve been called a gun nut before by people who think no one should have a gun. Didn’t bother me one bit. Fact is , it is legal to have a loaded gun in your car in Idaho just not hidden. This is a valuable conversation. Two observations. I agree that the term “gun nut” can be pejorative and adds little to the dialogue. I have good friends who are gun nuts and they allow me to use the term because we are good friends and they know I’m joshing. Perhaps gun enthusiast is more accurate and it won’t offend anyone. Second, you guys should carry to the next thread the Guardian started on the rewrite of the law before this one disappears. The law apparently affects us all so lets dive into fixing it.